Four US small business insurance tech startups have raised over $60M since October 2015 across five deals. Since the start of 2015, the small- and medium-sized business insurance market has seen a plethora of tech activity by both large insurers and tech upstarts. Specifically, four different US startups offering tech-enabled distribution of small business insurance have raised over $60M across five deals since October 2015. Among the deals’ backers were VCs and growth equity investors, including Oak HC/FT, Ribbit Capital, and Two Sigma Ventures. The most recent is Embroker, which raised a $12.2M Series A led by Canaan Partners in May, for its online business insurance-management platform and brokerage. The company also reportedly hasn’t ruled out extending its software program to existing brokers. [if lte IE 9]>var om_ie_browser = true;< ! [endif] / OptinMonster WordPress plugin. Earlier this year, Next Insurance, which raised a $13M seed round, partnered with Hiscox to distribute small business insurance online. Insurance comparison startup Insureon, which raised a $31M growth round in October 2015, reportedly did close to $18M in revenue in 2014 and has brokered policies for over 175,000 small businesses. Large insurers have also been on the move. Berkshire Hathaway Direct dba Cover Your Business launched in December 2015 to sell business insurance online and AIG, Two Sigma Ventures, and Hamilton Insurance Group announced a joint venture in small business insurance sales and analytics in April. 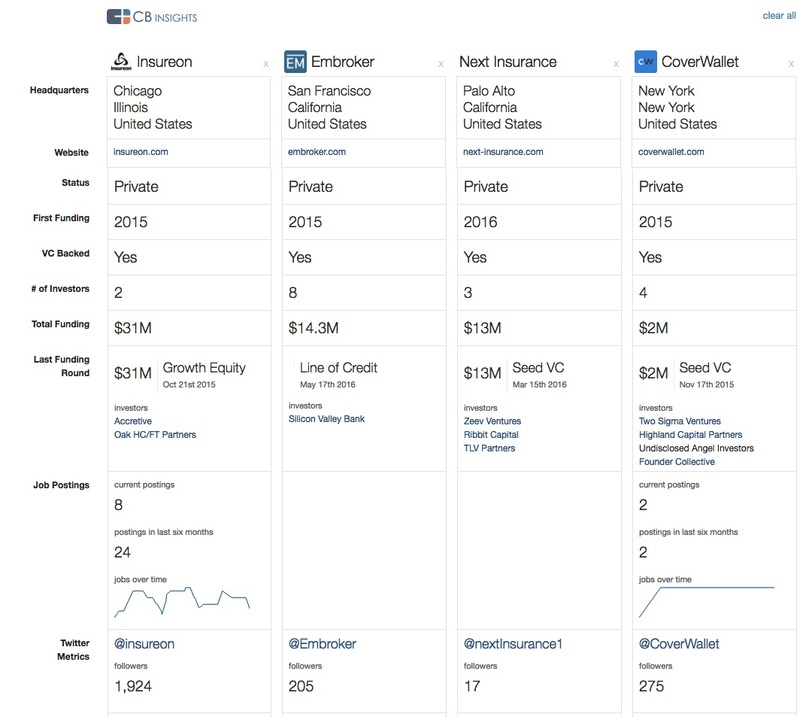 Given the quickly growing landscape, we used CB Insights Company Comparison Tool to compare the four private US online small business insurance companies — Insureon, CoverWallet, Embroker, and Next Insurance — that have raised funding since last October. Note: This visualization is available across all private companies on CB Insights. Looking for more insurance tech data and analysis? Sign up for the CB Insights Insurance Tech Insights newsletter. From sensor-enabled per-mile insurance to mobile policy management apps to digital annuity comparison platforms, the emerging insurance tech industry is growing at a rapid pace. Insurance Tech Insights is the first and only data-driven research publication covering the innovative technologies and companies revolutionizing distribution, underwriting, claims management & the rest of the insurance value chain as well as how insurance incumbents are responding to change.